§ 297-49 Word usage; definitions. Unless otherwise specifically provided, the words and phrases defined shall have the meanings indicated when used in this chapter. When necessary in this chapter, a specific term will be defined by a footnote where the term appears in the text. The Critical Area Zone (Article IX) contains a separate list of definitions which are applicable to only that zone. If a term is not defined in that section but is defined in this section, then the definition in this section controls. Words used in the present tense shall include the future tense; words used in the singular number shall include the plural number and the plural number shall include the singular number, unless the obvious construction of the wording indicates otherwise. The word "shall" is mandatory and not discretionary. The word "may" is permissive. The word "lot" shall include the words "piece," "parcel" and "plots"; the word "building" includes all other structures of every kind, regardless of similarity to buildings; and the phrase "used for" shall include the phrase "arranged for" and "occupied for." All measured distances shall be rounded to the nearest integral foot. A second dwelling unit that is part of an existing one-family detached dwelling or is located in a separate accessory structure on the same lot as the main dwelling, for use as a complete, independent facility with provision within the accessory apartment for cooking, eating, personal sanitation and sleeping. Such a dwelling unit is subordinate to the main dwelling. See "use, accessory." Also see § 297-29 of Article II. Processing necessary to store and market farm products. Basic processing does not include treatment that changes the form of the product, but does include treatment such as cutting, drying and packaging. Treatment that changes the form of a farm product in order to increase its market value, including such processes as canning, milling, grinding, freezing, heating and fermenting. Value-added processing may include the incidental use of ingredients not grown locally, such as the addition of sugar or seasonings. Cutting, trimming, grinding, smoking, curing and freezing locally raised or obtained meat; does not include slaughtering, skinning, dehairing and eviscerating. An establishment for the slaughter, skinning, dehairing and eviscerating of livestock, poultry, waterfowl or game, in which the operation is limited to livestock or game that is locally produced or obtained. The use is limited to processing of products from Maryland and adjoining states. An Ag tourism facility is an agricultural-related business located on a farm that is open for customers and tourists for at least six months of the year, for at least four days a week, and which provides tours and on-site sales or samples of primarily Charles County agricultural products. The use of land for agricultural purposes, including dairying, pasturage, agriculture, apiaries, horticulture, floriculture, orchards, agricultural nurseries, viticulture and animal and poultry husbandry and the necessary accessory uses for packing, processing, treating or storing the produce; provided, however, that the operation of any such accessory uses shall be secondary to that of normal agricultural activities; and provided further, that the above uses shall not include the acceptance or disposal of land clearing debris or rubble which originates off-site or the commercial feeding of garbage or offal to swine or other animals. The breeding, raising, training and general care of livestock for uses other than food, such as sport or show purposes, as pets or for family recreations, shall be considered a normal farming function, but kennels are excluded from this definition. Any land area which is used or intended for use for the landing and taking off of 20 or more aircraft, and any appurtenant accessory areas which are used or intended for use for airport buildings or other airport facilities or rights-of-way, including all necessary taxiways, aircraft storage and tie-down areas, hangars and other necessary building and open spaces. This term does not include private use airports. Any airport for personal use of the property owner, which includes no commercial uses. Exterior equipment designed to transmit or receive electronic signals. A person, corporation or company whose request initiates the administrative procedures for the issuance of a zoning permit, zoning change, special exception, variance, appeal, sign permit or other decision based on this chapter. The commercial rearing of finfish, shellfish and aquatic plants for sale, trade, barter or shipment. "Aquaculture" shall not include the processing of this material other than what is necessary for transportation from the site. A story having 1/2 or more of its floor-to-ceiling height below the average level of the adjoining ground and with a floor-to-ceiling height of not less than 6 1/2 feet. An existing single-family, owner-occupied dwelling that is used for lodging guests for compensation, none of whom remain for more than seven consecutive nights, and that provides food or beverage service for the overnight guests, including breakfast at a minimum. A commercial operation producing forged iron products, including horseshoes, except that a farrier whose operation is limited to shoeing horses or other equine is not a commercial "blacksmith." A single-family detached residence consisting of at least one dwelling unit, together with more than two rooms that are rented or are designed or intended to be rented but, individually or collectively, do not constitute separate dwelling units. A rooming house or boardinghouse is distinguished from a bed-and-breakfast or tourist home in that the former is designed to be occupied by longer-term residents as opposed to overnight or weekly guests. A structure having one or more stories and a roof designed primarily as a place of occupancy, storage or shelter. 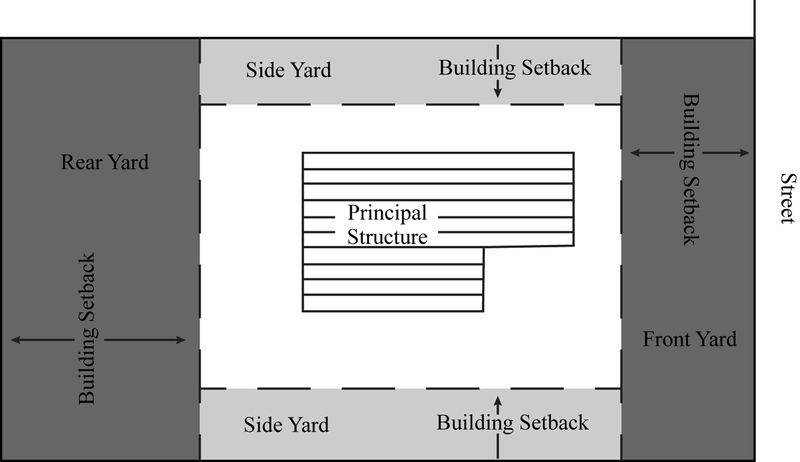 A building subordinate to and located on the same lot as a principal building and used incidentally to a principal building or housing an accessory use, which is not attached to the principal building in any way. The total number of square feet area in a building, excluding cellars, uncovered steps and uncovered porches, but including the total floor area of accessory buildings on the same lot. Establishments primarily engaged in rendering services to businesses on a fee or contract basis. Some illustrative but noninclusive examples are actuarial services, advertising services, blueprinting and photocopying, catering, credit reporting and collection services, data processing, detective and protection services, direct-mail advertising, disinfecting and exterminating, duplicating and publishing, employment agencies and services, janitorial services, motion picture distribution services, office or business equipment rental and leasing, photo finishing, secretarial or stenographic services, tag and title services, telecommunications, window cleaning and computer processing. A lot, tract or parcel of land upon which two or more campsites are located, established or maintained and occupied by camping units for children or adults, or both. Camps will include tents, cabins, dormitories, dining halls, active and passive recreation facilities. A roof-like structure of a permanent nature which may be freestanding or projected from a wall of a building or its supports. An area of land and/or a structure with mechanical or hand-operated facilities used principally for the cleaning, washing, polishing or waxing of motor vehicles. Any establishment for the commercial boarding of five or more adult cats for which a fee is charged. That portion of the parking area used for access to parking or loading areas or other facilities on the lot. Driveways and other maneuvering areas (other than parking aisles) comprise the circulation area. A development concept which encourages and permits variations in residential developments by allowing deviation in lot size, type of dwelling, lot coverage and open space from that which is normally required in the applicable zone as further described under Article XIV. A dwelling unit located above and/or behind the principal commercial use. A source of water supply and distribution system serving two or more individual lots, dwelling units, businesses, commercial or industrial establishments or any combination thereof, and may be publicly or privately owned and/or operated. Installing plants that are suited to the site conditions (sun exposure, soil moisture, soil pH and soil type), native to the region, and that emulate a specific habitat (woods, wetland or meadow). The performance of work by, or furnishing of supplies to, members of the building trades. Some illustrative but noninclusive examples are: building contractors; carpentry and wood flooring services; electrical services; energy systems service and products; general contractors; masonry, stonework, tilesetting and plastering services; plumbing, mechanical, heating and air-conditioning services; roofing and sheet metal services; septic tank sales, service and installation; sign painting; and cabinetmaking. A one-story retail store containing less than 4,000 square feet of gross floor area that is designed and stocked to sell primarily food, beverages and other household supplies. It is designed to attract, and depends upon a large volume of, stop-and-go traffic. Illustrative examples of "convenience stores" are those operated by the "High's," "7-11" and "Dash-In" chains. An accessory business operation conducted within an existing accessory structure to a principal residential dwelling on a property or within an existing structure located on a farm adjoining and under common ownership with a lot containing the primary domicile of the common property owner and located within the AC, RC, or RR Zones in full compliance with the conditions and requirements specified in § 297-29B(22) of the Charles County Zoning Ordinance. See also definition of "home occupation." Any detached residential structure at least 50 years old in which rooms are rented to paying guests on an overnight basis with meals served daily in said structure. A country inn may also provide catering and facilities for banquets, weddings, receptions, reunions and similar one-time events which are not open to the public generally. A place where day care is provided to nine or more dependent individuals, not members of the family that resides on the premises, but not including public or private schools organized, operated or approved under Maryland laws or day-care homes registered with the Department of Social Services, as set forth in the Family Law Article of the Annotated Code of Maryland. A residence in which care is given to a child in place of parental care, for less than 24 hours a day, other than the child's residence, for which the day-care provider is paid. No more than two children under age two and no more than eight children, including the provider's own, may be provided for. Any activity, other than normal agricultural activity, which materially affects the existing condition or use of any land or structure, including mines, landfills or land disturbances such as grading, paving and excavation. Any private way used to provide motor vehicle access to three or more lots or three or more distinct areas or buildings in unsubdivided developments. That portion of a parking area that consists of a travel lane bounded on either side by an area that is not part of the parking area. A building or portion thereof designed or used exclusively for residential occupancy, including single-family dwellings, two-family dwellings and multifamily dwellings (not including hotels and motels). A building containing two or more dwelling units having common walls or roof and a separate ground-level entry for each unit. An enclosure containing sleeping and kitchen facilities designed for and used or held ready for and as a permanent residence by one family. An antenna and attendant processing equipment for reception or transmission of electronic signals from satellites where the structure is in excess of 12 feet in diameter. See "residence, elderly care home." People who are 62 years of age or over or families where either the husband or wife is 62 years of age or older. Buildings and structures for the occupancy, use, support or housing of switching equipment, regulators, stationary transformers and other such devices for supplying electric service; telephone offices; radio or television transmitter towers and stations; and aboveground pipelines. A branch of physics that deals primarily with energy (physical, chemical or biological) and its transformations, including the research and development of pyrotechnics, explosives, and propellants. A lawful building in place at the time of the enactment of this chapter. The exterior elevation or face of a building from ground level to roofline. An individual or two or more persons related by blood or marriage or a group of not more than eight persons, excluding servants, not related by blood or marriage, living together as a single housekeeping group in a dwelling unit. A private, nonprofit cemetery used for the burial of deceased members of the extended family of the owner of the land. A facility consisting of agricultural land and structures established and used for agricultural training and startup agricultural operations. The use includes office, classroom and training facilities; buildings used in farming operations; and land used for growing crops and raising livestock. An individual who shoes horses or other equine. A farrier whose operation is limited to horseshoeing is not a commercial blacksmith. The quotient determined by dividing the gross floor area of all buildings on a lot by the total area of that lot. For the purpose of calculating floor area ratio, the floor area of a parking garage structure (attached, integrated, or detached) shall not be included in the gross floor area of occupied buildings. The length of a property line abutting a public street, road, highway or private right-of-way recorded in the land records of Charles County. A building with no more than three stories containing four or more dwelling units off a common entry. Any retail trade use characterized by the sale of bulky items, outside display or storage of merchandise or equipment such as lumber and building materials, farm implements, garden supplies, feed and grain storage, marine equipment sales and service, stone monument sales and like uses. Total site acreage minus any tidal wetland acreage equals "gross developable area." The total area of a building measured by taking the outside dimensions of the building at each floor level intended for occupancy or storage. Gross developable area multiplied by the number of dwelling units permitted per acre in a given zone. A contiguous assembly of one or more lots, for the purpose of filing an application for development. A residence in which individuals who are under treatment for a mental disorder may be provided care or treatment in a home-like environment, as provided for in the Mental Hygiene Law of the Annotated Code of Maryland. Also a residence within a single dwelling unit for at least six but not more than eight unrelated individuals who are physically or mentally handicapped or infirm or under the age of 18, together with not more than two persons providing care or assistance to such persons not requiring medical treatment, all living together as a single housekeeping unit. Persons residing in such homes, including the aged and disabled, principally need residential care rather than medical treatment. Dwelling or lodging units for temporary nonpaying guests in an accessory building. No such quarters shall be occupied by the same guests for a period of more than three months in any twelve-month period, and no such quarters shall be rented, leased or otherwise made available for compensation of any kind. A home for not more than nine unrelated people who have demonstrated a tendency toward alcoholism, drug abuse or antisocial or criminal conduct, together with not more than two people providing supervision and other services to such persons, all of whom live together as a single housekeeping unit. An area, either at ground level or elevated on a structure, that is used or intended to be used regularly for the landing and taking off of helicopters, which may include major helicopter support facilities for fueling, maintenance, parking or storage, administration offices, cargo loading and waiting room. "Heliports" may be public or private. An area, either at ground level or elevated on a structure, that is used or intended to be regularly used for the landing or taking off of helicopters without major helicopter support facilities. An area is a "helistop" if helicopters land and take off more than five times per week or use the site for more than 20 days during a twelve-month period. "Helistops" may have minor support facilities such as a sheltered waiting or loading area and an administrative office, if necessary, but shall not have facilities for fueling, maintenance, parking or storing or major cargo loading. "Helistops" may be public or private. An activity carried out for financial gain within a dwelling by the resident(s) which is subordinate to the residential use of the property. Home occupations shall be conducted in full compliance with the conditions and requirements specified in § 297-29B(18) of the Charles County Zoning Ordinance. See also the definition of "cottage industry." A building or group of buildings having room facilities for one or more abiding patients, used for providing services for the inpatient medical, psychiatric or surgical care of sick or injured humans and which may include related facilities such as laboratories, outpatient departments, training facilities, central service facilities and staff offices; provided, however, that such related facility must be incidental and subordinate to the main use and must be an integral part of the hospital operation. A building or group of buildings containing guest rooms where, for compensation, lodging is provided for transient visitors. A hotel, motel or inn is not a bed-and-breakfast, boardinghouse, fraternity or sorority house or school or college dormitory as may be defined and regulated elsewhere in this chapter. A stream in which surface water is absent during a portion of the year. An open area where waste or scrap materials, including but not limited to scrap iron and other metals, paper, rags, rubber tires and bottles, are bought, sold, exchanged, stored, baled, packed, disassembled or handled. It includes an auto wrecking yard or the storage of three or more inoperable vehicles, but excludes uses established entirely within enclosed buildings and wrecked motor vehicles stored for a period of not more than 90 days. Any establishment for the commercial breeding, boarding, grooming, sale or training of five or more adult domestic animals for which a fee is charged, provided that an animal hospital maintained by a licensed veterinarian as part of the practice of veterinary medicine for the treatment of animals shall not be considered a "commercial kennel." An area containing plant materials, including trees, shrubs, ground cover and other vegetation, established and maintained for enhancing the appearance of the site, noise reduction, buffering or screening. Where appropriate, a landscape area may also include walls or fences, benches, terraces, pathways and similar features. A parcel of land whose boundaries have been established by a recorded deed or a recorded subdivision plat filed among the land records of the County, but not including land identified on any such plat as an outlot. If a public body or any authority with the power of eminent domain condemns, purchases or otherwise obtains fee simple title to a strip of land cutting across a parcel of land otherwise characterized as a "lot" by this definition or a private road is created across a parcel of land otherwise characterized as a "lot" by this definition and the interest thus obtained for the road so created is such as effectively to prevent the use of this parcel as one lot, then the land on either side of this strip shall constitute a separate lot. The Zoning Officer and the owner of two or more contiguous lots may agree to regard the lots as one lot if necessary or convenient to comply with any of the requirements of this chapter. In a residential zone, when a private road that serves more than three dwelling units is located along any lot boundary, then the lot boundary for purposes of computing the lot area shall be 25 feet from the center of the traveled portion. A lot situated at the intersection of two or more streets. The computed ground area occupied by all buildings within a lot. The mean horizontal distance between the front lot line and rear lot line of a lot, measured within the lot boundaries. That boundary of a lot which is along an existing private or dedicated public street or, where a public street exists, is along a public way. In the case of a corner or through lot, both boundaries along a public way shall be considered "front lot lines." The lot line opposite and most distant from the front lot line. In the case of triangular or otherwise irregularly shaped lots, a line at least 10 feet in length entirely within the lot, parallel to and at a maximum distance from the front lot line. In the case of corner and through lots, one "rear lot line" shall be established. The property lines bounding the lot. Any boundary of a lot which is not a front lot line nor a rear lot line. A parcel of land which is shown on a recorded plat but which is not to be occupied by a building or otherwise considered as a buildable lot within the meaning of this chapter. No building permit shall be issued on any land so designated. A lot with a narrow stem, extension or "handle" which provides frontage on a public road or public road right-of-way or a private road right-of-way recorded in the land records of Charles County. A lot with frontage on a cul-de-sac and side lot lines which extend from the common radial point of the cul-de-sac or with frontage on the outside edge of a road curve and side lot lines perpendicular to the road center line. A parcel of land which has been legally recorded in the land records of Charles County. A lot having a pair of opposite lot lines along two more or less parallel public streets and which is not a corner lot. On a "through lot," both street lines shall be deemed front lot lines. The horizontal distance between the lot lines along a straight line parallel to the front line at the minimum required building setback line. A dwelling unit that is not constructed in accordance with the standards set forth in the County's Building Code applicable to site-built homes; is composed of one or more components, each of which was substantially assembled in a manufacturing plant and designed to be transported to the home site on its own chassis; and exceeds 40 feet in length and eight feet in width. The tongue, axles, transporting lights and removable towing apparatus are removed after placement on the lot and before occupancy. A manufactured home constructed after July 1, 1976, that meets or exceeds the construction standards promulgated by the United States Department of Housing and Urban Development that were in effect at the time of construction but that does not satisfy the criteria necessary to qualify the house as a Class A manufactured home. A residential use in which more than one manufactured home is located on a single lot. Processing, creating, repairing, renovating, painting, cleaning and assembling of goods, merchandise or equipment. Retail sales and service uses may be included, provided that the products sold are manufactured on the site or accessories to products manufactured on the site by the owner or lessee of the site, not more than 10% of the floor space of the main structure may be devoted to the retail sales of articles made on the premises and any service facilities are limited to the repair and/or service of products manufactured by the owner or lessee of the site. Nothing herein contained shall be construed to permit the operation of general retail sales business. A place for docking four or more pleasure boats or providing services to pleasure boats and the occupants thereof, including minor servicing and repair to boats while in the water, sale of fuel and supplies and provisions of goods, beverages and entertainment as accessory uses. A yacht or boat club shall be considered as a "marina." A roof-like structure of a permanent nature which projects from the wall of a building or its supports and may overhang the public way. One or more structures, buildings, tents, barracks, trailers, vehicles, manufactured homes, converted buildings and unconventional enclosure of living spaces established, operated or used as living quarters for four or more migratory workers engaged in agricultural activities, including related food processing. A building in which the predominant uses on the first floor are retail, restaurant, or commercial services and the predominant uses on the upper levels are residential apartments or offices. A mixed-use building designed for residential use on an least one level above the first floor. A self-contained mobile vehicle or trailer that sells food from parking lot curb or parked side of the vehicle to the public. A mobile food service facility does not include ice cream trucks or sandwich trucks for commercial sites. Ice cream trucks and sandwich trucks are not regulated by these requirements. A dwelling unit composed of components substantially assembled in a manufacturing plant and transported to the building site for final assembly on a permanent foundation. Among other possibilities, a "modular home" may consist of two sections transported to the site in a manner similar to a manufactured home or a series of panels or room sections transported on a truck and erected or joined together on the site. See "hotel, motel or inn." Buildings and premises where gasoline, oil, grease, batteries, tires and automobile accessories may be supplied and dispensed at retail and where, in addition, minor repair work may be performed, such as ignition service, tire repair or repair and replacement of minor parts such as pumps and filters, brake service and the like. "Motor vehicle fuel sales" does not include a repair or body shop, but shall include self-service filling stations and any convenience store accessory to or associated with such gas sales. A car wash with up to two bays may be permitted as an accessory use. Storage and display for sale of more than one motor vehicle or any type of trailer, provided that the trailer is unoccupied, and where repair or body work is incidental to the operation of the new or used vehicle sales. A building or portion thereof containing three or more dwelling units. Any utility facility needed to provide a basic service such as water, sewer, telephone and cable television to the individual users. A situation that occurs when, on the effective date of this chapter, any previously lawfully existing lot or structure or use of an existing lot or structure does not conform to one or more of the regulations applicable to the zone in which the lot or structure is located. 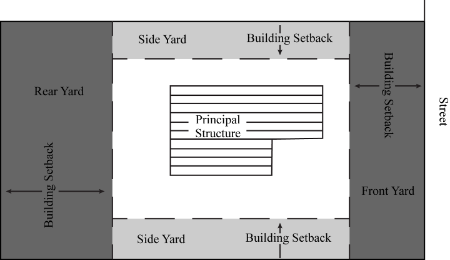 Among other possibilities, a "nonconforming situation" may arise because a lot does not meet minimum acreage requirements, because structures exceed maximum height limitations, because the relationship between existing buildings and the land (in such matters as density and setback requirements) is not in conformity with this chapter or because land or buildings are used for purposes made unlawful by this chapter. Nonconforming signs shall not be regarded as "nonconforming situations" for purposes of Article XXVIII, but shall be governed by the provisions of Article XIX. An institutional facility maintained for the purpose of providing skilled nursing care and medical supervision at a lower level than that available in a hospital to more than nine persons. A commercial establishment or an accessory use which offers pari-mutuel betting at a satellite simulcast facility of a thoroughbred or harness race that is simulcast from a sending track by a state licensee and which transmits pari-mutuel information regarding bets back to the sending track. Uncovered areas for public enjoyment consisting of such things as green areas, gardens, plazas, walks, pathways, promenades, arcades, lawns, fountains, decorative plantings, passive or active recreational areas and uncovered areas used for agriculture or forestry. Such space shall not include parking or maneuvering areas for vehicles. Areas devoted to this are readily accessible to the public or residents of the development. That portion of a lot that is used by vehicles for access, circulation, parking and loading and unloading. It comprises the total of circulation areas, loading and unloading areas and parking areas. A portion of the vehicle accommodation area consisting of lanes providing access to parking spaces. An area set aside for the parking of one vehicle. A stream containing surface water throughout an average rainfall year. Services rendered to an individual. Examples are beauty and barber shops, clothing alterations, dance and music studios, fur repair, interior decorating, photography studios, rug cleaning and repair (in-home cleaning), shoe repair, watch and jewelry repair, appliance repair and furniture repair. Specialized semi-conductor materials that absorb sunlight and converts it into electricity through a process known as the photoelectric effect. Inter-connected assemblies or layers of these solar cells are integral components in certain types of solar energy systems, which form solar modules, solar panels, solar arrays, solar shingles, solar tiles and thin-films among others. The field of technology and research related to the application of solar cells for energy by converting the sun's energy directly into electricity. One hundred fowl on 50 acres or more. The finely divided residue which results from combustion of ground or powdered coal and is released by combustion gases, as further defined in § 7-464 of the Natural Resources Article, Annotated Code of Maryland, as amended. An area where pozzolan is deposited or landfilled in accordance with sound engineering practices and may be later reclaimed or mined. The lines bounding a lot, as defined herein. An establishment for the production and retail sale of not more than 2,000 barrels per year of beer that operates in conjunction with an on-site restaurant. A pub-brewery must operate under a Class 6 liquor license issued pursuant to the Maryland Annotated Code, Alcoholic Beverages Article, § 2-208. The lot shall be demonstrated to be acceptable to the future property owner, organization or agency, including reasonable access and maintenance. Written acknowledgement by the future property owner, organization or agency is to be provided prior to preliminary subdivision plan approval. The proposed use of the lot is clearly specified on the subdivision plan and plat and determined to be an appropriate use by the Planning Commission as a part of the preliminary subdivision plan approval process. Appropriate deed restrictions are recorded with the final subdivision plat. Any sidewalk, street, alley, highway or other public thoroughfare. A structure that is intended to be transported over the streets and highways (either as a motor vehicle or attached to or hauled by a motor vehicle) and is designed for temporary use as sleeping quarters, but that does not satisfy one or more of the definitional criteria of a manufactured home. Any site, lot, parcel or tract of land which is improved, used or intended to provide a location for the servicing or temporary accommodation of one or more trailers which are used for travel, camping or recreational purposes. A two-family residential use in which the dwelling units share a common wall, including the wall of an attached garage or porch. Group, family-style, assisted housing for the elderly in existing single-family detached homes which provide a residential environment and supervised personal services for persons over the age of 62 who have temporary or periodic difficulties with one or more essential activities of daily living. Any such facility shall be certified or licensed by the State of Maryland. A building containing four or more dwelling units off a common entry with no more than three stories. Residence, Garden Apartment: plan, perspective and layout. A building containing eight or more dwelling units with six or more stories and a common entry. Residence, High-Rise: plan, perspective and layout. A building on a single lot containing one dwelling unit located with one side on or near one side lot line and designed to orient interior living space to the other three yards. Residence, Lot Line: plan, perspective and layout. A building containing eight or more dwelling units off a common entry with four or five stories. Residence, Mid-Rise: plan, perspective and layout. A residential use consisting of a building containing three or more dwelling units. For purposes of this definition, a building includes all dwelling units that are enclosed within that building or attached to it by a common floor or wall (even the wall of an attached garage or porch). A building containing three or more attached dwelling units having common walls or roof and a separate entry for each unit. Residence, Multiplex: plan, perspective and layout. A residential use having the external appearance of a single-family residence but in which there is located a second dwelling unit that comprises not more than 50% of the gross floor area of the building, and the minimum floor area shall also be 300 square feet. Permanently affixed to a foundation supporting the load-bearing framework of the manufactured home and a foundation wall enclosing its entire perimeter. A building containing three or more attached dwelling units in a row having access from the front and rear of the dwelling. Residence, Townhouse: plan, perspective and layout. A place of business being operated for the retail sale of food and other goods, services or entertainment which is designed to allow patrons to be served or accommodated while remaining in their automobiles or which allows the consumption of any food or beverage obtained from a carry-out window. Any establishment where ready-to-eat food primarily intended for immediate consumption is available upon a short waiting time and packaged or presented so that it can either be eaten inside the premises or served customers in motor vehicles at a drive-through window. An establishment where ready-to-eat food primarily intended for immediate consumption is available upon a short waiting time and wrapped or presented so that it can readily be eaten outside or inside the premises. An establishment where ready-to-eat food primarily intended for immediate consumption is available upon a short waiting time and packaged or presented so it can readily be eaten away from the premises as there are no facilities for on-premises consumption of food. A food-serving establishment whose principal business is the production and sale of food ordered from a menu and served to seated customers at a table, booth or counter inside the establishment. A snack bar or refreshment stand at a public or nonprofit community swimming pool, playground or park operated solely for the convenience of its patrons shall not be considered a restaurant. Buildings ranging from 100,000 square feet or larger designed for use as a discount department store offering a wide variety of merchandise; a product category store offering a large selection of merchandise of a particular type of product; a warehouse club offering a variety of bulk goods at discount prices, or an outlet store. No more than 50% of the building's floor area is permitted to be subleased or subdivided for other businesses. Reference the requirements of use, 6.01.150, in Article XIII. A residential institutional facility providing a graduated range of housing and services for individuals who are 55 years of age or older, ranging from single-family attached, detached or multifamily dwelling units to congregate housing facilities. For all dependent and semi-independent living units within the complex, such facilities shall include communal dining and food preparation facilities, laundry and cleaning facilities, common recreation and meeting space, and medical and personal services, provided that none of these ancillary facilities or services are available to the general public, unless otherwise permitted within the zone in which the use is located. A road which carries the major portion of the traffic entering and leaving an area of the County. A road which provides for principal internal movements at low to moderate operating speeds within residential neighborhoods, business or industrial areas and which is a primary means of circulation between adjacent neighborhoods and which functions to distribute traffic from arterials to local and other collector roads and collects traffic from local roads and channels it into the arterial system. A street that terminates in a vehicular turnaround. A road which primarily provides direct access to abutting property. Overall operating speeds are low in order to permit frequent stops or turning movements to be made with maximum safety. A street that is parallel to and adjacent to an arterial street and that is designed to provide access to abutting properties so that these properties are somewhat sheltered from the effects of the through traffic on the arterial street and so that the flow of traffic on the arterial street is not impeded by direct driveway access from a large number of abutting properties. An arterial road with special requirements for landscaping and access. These include roads like Western Parkway, St. Patrick's Drive, Smallwood Drive and St. Charles Parkway. An arterial road which carries a high volume of traffic for interstate or intercounty travel. These include roads like U.S. Route 301, MD Route 5, MD Route 210, MD Route 205, MD Route 228 from MD Route 210 to Beale Hill Road to U.S. Route 301 and MD Route 6 east of La Plata. All private rights-of-way recorded in the land records of Charles County used to provide motor vehicle access to one or more lots. A public street or a street with respect to which an offer of dedication and improvements consistent with the County's Road Ordinance has been made. The cross-sectional dimension of the circle swept by the rotating blades. An antenna and attendant processing equipment for reception of transmission of electronic signals from satellites where the structure is less than 12 feet in diameter. The pari-mutuel betting at a satellite simulcast facility in the County on a race that is simulcast from a sending track by a Mile Thoroughbred Racing licensee or a Harness Racing licensee; and the transmission of the pari-mutuel information regarding bets at the satellite simulcast facility to the sending track. A line which is a required minimum distance from the road right-of-way and any lot line that establishes the area within which buildings or structures must be erected or placed. A shelter operated by a public or nonprofit organization to provide temporary housing to an individual or a family in emergency before the individual or the family move(s) to a more permanent place. A permanent shelter could be a single-family dwelling unit or a larger building which could either have a common kitchen and bathroom or efficiencies with separate provisions for cooking and bathing. The maximum stay of an individual or a family shall not exceed one year. A shelter operated for no more than 30 days by a public or nonprofit organization to provide housing to individuals or families. A concentrated grouping of retail and service uses designed, developed and managed as an integral entity providing common vehicle access and group parking. Commodities which tend to be purchased on a comparison basis, including apparel and accessories, automobile supplies, business equipment sales and service, china and glassware, commercial art, communications equipment sales and service, draperies, fabrics and upholstery, floor coverings, furniture, hardware, home appliances and furnishings, luggage and leather goods, musical instruments and supplies, paint and wall coverings, party supplies, photographic equipment sales and service, radios, records and tapes, secondhand merchandise, sporting goods, television and stereo sales and service, toys and games shops and like uses. Establishments commonly referred to as catalog showrooms, department stores, discount stores, variety stores and supermarkets shall be regulated as "shoppers' merchandise." Rental businesses of any merchandise allowed to be sold in the respective zone shall be regulated as "shoppers' merchandise." Any shoreline that has a historical shoreline erosion of four to eight feet or greater according to the Atlas of Historic Erosion Rates in Maryland (Coastal Resources Division, Tidewater Administration). Any structure, part thereof or device attached thereto or painted or represented thereon or any material or thing, illuminated or otherwise, which displays or includes any numeral, letter, word, model, banner, emblem, insignia, device, trademark or other representation used as or in the nature of an announcement, advertisement or direction or to attract attention to any person, firm, group, organization, place, commodity, product, service, business, profession, enterprise or industry which is located upon any land, vehicle, building, on or upon a window or indoors and which is visible from any street, right-of-way, sidewalk, alley, park or other public property. The flag, emblem, insignia, poster or other display of a nation, political unit, educational, charitable, religious or similar group, campaign, drive or event shall not be included within the meaning of this definition. Customary displays of merchandise or objects and material without lettering placed behind a store window are not "signs" or parts of "signs." The entire area enclosing the extreme limits of writing, representation, emblem or any figure of similar character, together with any frame or other material or color forming an integral part of the display or used to differentiate the sign from the background against which it is placed, excluding the necessary supports or uprights on which such sign is placed. Where a sign has two or more faces, the area of all faces shall be included in determining the area of the sign, except that where two such faces are placed back-to-back and are at no point more than two feet from one another, the area of the sign shall be taken as the area of one face if the two faces are of equal area or as the area of the larger face if the two faces are of unequal area. See "sign, wall" and "sign, projecting." A sign which directs attention to a business, commodity, service or other activity conducted upon the premises upon which such sign is located. A sign designating the location of a community or an institution of a public or quasi-public nature or the opening of an event of public interest, but not including signs pertaining to real estate. A sign supported by uprights or braces in or upon the ground surface. A structure consisting of uprights of braces in or upon the ground surface supporting one or more signs. Nameplates or signs designating accessory uses, such as a doctor's office, home occupation or similar use or advertising exclusively the sale of farm products produced on the premises. A sign which touches ground level and is not higher than 12 feet above the road grade. A sign located on the premises to which it pertains. A sign, including a billboard, which directs attention to a business, commodity, service, entertainment or other activity conducted, sold or offered elsewhere than on the premises upon which such a sign is located. A permit issued by the Zoning Officer that authorizes the recipient to erect, move, enlarge or substantially alter a sign. A sign which is attached directly to the building or wall and which extends from the face of the wall based upon what the current building code allows. A sign advertising the sale, lease, rental or development of any particular premises or directing attention to the opening and location of a new subdivision, neighborhood or community. A sign which is erected, constructed and/or maintained upon and projects above or beyond the roof or parapet wall. A sign, banner or other advertising device constructed of cloth, canvas, fabric or other light temporary material, with or without a structural frame, intended for a limited period of display, including decorative displays for the holidays or public demonstrations. A sign which is painted on or attached directly to the building wall and which extends not more than what the current building code allows from the face of the wall. Any site plans other than those identified as minor site plan applications. Site plans for detached single- and two-family dwellings, accessory buildings, additions less than 1,200 square feet for residential uses and change in use. One room containing sleeping and bathing facilities designed for and used as a permanent residence by one or two individuals. Kitchen facilities may be contained in the unit or may be part of the common area shared by at least three SRO units. Each SRO unit shall be considered 1/3 of a dwelling unit for purposes of calculating density and parking requirements. An establishment for the production and sale of not more than 2,000 barrels per year of wine made from produce grown off site. This use may provide wholesale sales and must include on-site retail sales and an on-site tasting room or restaurant. A small-scale winery must operate under a Class 4 liquor license issued pursuant to the Maryland Annotated Code, Alcoholic Beverages Article, § 2-206. A solar collection system which relies upon sunlight as an energy source for electricity generation, space heating, space cooling, or water heating. The individual(s) or entity that owns, or intends to own, the property upon which the solar energy system will be operated in accordance with this chapter. The owner could be multiple parties in the case of a power purchase agreement. A solar collection system that generates electricity from sunlight and is interconnected with an electric utility power grid. The system may receive backup power from a local utility power grid when the system is not producing enough power to meet demand and may include optional battery storage equipment to provide individuals backup power during utility-related outages. When the system generates excess power, it may be redistributed onto the power grid for other customers to utilize, in accordance with current state net-metering laws. A solar collection system that is installed upon a pole, rack or suitable foundation, on the subject property. A solar collection system that generates electricity from sunlight, to be sold for-profit to a wholesale electricity market through a regional transmission organization and an interconnection with the local utility power grid and/or for direct distribution to a number of properties and consumers. A solar collection system that is typically utilized when a public utility power source is not available or is not cost effective to connect to. This type of solar energy system may include batteries or some other form of power storage and/or a fueled generator for supplemental short-term support or shaving peak loads. This system is generally utilized to provide energy to remote locations where power is required for uses such as electricity generation, space heating, space cooling, or water heating. A solar collection system that is installed upon or is part of the roof of a building or structure located on the subject property. Systems integrated as awnings or attached to the roofs of porches, sheds, carports and covered parking structures also fall under this distinction. A solar collection system that generates energy from sunlight for direct consumption on the subject property and/or for inter-connection to the electric utility power grid to offset energy use on the subject property, in accordance with current state net-metering laws. A retail store which carries only one type of interrelated goods, including bookstores, candle shops, cosmetic shops, florist shops, gift shops, hobby and craft supply shops, novelty shops, pet shops, photographic shops, souvenir shops, stationery shops, tack shops, tobacco shops, liquor stores, wine and cheese shops, video rental, bicycle sales and service (nonmotorized) and like uses. Any stable for the housing of horses or other equine, operated for remuneration, hire, sale or stabling or any stable, not related to the ordinary operation of a farm, with a capacity for more than four equine. A portion of a building that is accessible by an interior stairway, designed and constructed to be occupied for human activity, and located between the surface of any floor and the surface of the floor next above it, or, if there is no floor above it, between the floor and the ceiling above it. A perennial or intermittent watercourse created naturally or artificially which contains flow from surface water and water originating from a groundwater source during a portion of the year, as field verified. A classification of streams based on stream hierarchy. The smaller the stream and the fewer its tributaries, the lower its numerical classification. Stream order hierarchy depends on position in a watershed. Low-order streams are found in the upper reaches of a watershed; higher-order streams exist in the lower reaches of a watershed. A first-order stream does not have tributaries and normally originates from springs or seeps. A second-order stream begins at the confluence of two first order streams, etc. An assembly of materials forming a construction for occupancy or use, including, among others, buildings, stadiums, gospel and circus tents, reviewing stands, platforms, stagings, observation towers, radio and television broadcasting towers, water tanks, trestles, piers, wharves, buildings located on piers or wharves, sheds, skateboard ramps, coal bins, shelters, fences, walls, signs and light poles. Objects such as swing sets, jungle gyms, mailboxes, tree houses and woodpiles are ordinarily not "structures." The division of a tract of land into two or more lots, building sites or other divisions for the purpose of sale or building development. A design of residential or mixed-use developments that contain a residential component that is designed and constructed to demonstrate optimal land planning with greater efficiency, environmental sensitivity, resource conservation, convenience and amenity than required under the base zone regulations (Article VI), or cluster development (Article XIV) regulations, whichever is applicable. Appendix I sets forth the specific criteria for superior design. Any man-made surfaces that are resistant to the penetration of water. Concrete, brick paving, roofs and heavily used gravel roads and parking areas which are subject to high levels of compaction are examples of "impervious surfaces." A dwelling that exists on a farm that is occupied on a temporary or permanent basis. The tenant shall be actively involved in the farming operation either on a part-time or full-time basis. The vertical distance from the lowest grade at the structure's foundation to the building's cornice, soffit or top of parapet wall. Any ground- or roof-mounted pole, spire, structure or combination thereof taller than 15 feet, including supporting lines, cables, wires, braces and masts, intended primarily for the purpose of mounting an antenna, meteorological device or similar apparatus above grade. The term "tower" includes any apparatus attached to the structure except wireless communication antennas, use 4.06.500. A lot (see definition of "lot"). The term "tract" is used interchangeably with the term "lot," particularly in the context of subdivisions, where one "tract" is subdivided into several lots. Usable open spaces shall not include areas statutorily excluded from development such as jurisdictional wetlands and required buffer yards. The purpose or activity for which land, buildings or structures are designed, arranged or intended or for which land, buildings or structures are occupied or maintained. A use which is customarily incidental and subordinate to the principal use of a lot or the main building thereon and located on the same lot as the principal use or building. A use which may be lawfully established in a particular zone or zones provided that it conforms with all regulations, requirements and standards of such zone. The primary purpose or purposes for which a lot or the buildings thereon are designed, arranged or intended and for which it is or may be used, occupied or maintained. Any dwelling unit or use listed in the Table of Permissible Uses under the categories 3.00.000, Residential, or 4.03.000, Institutional residence or care or confinement facilities. An area that it inundated or saturated by surface or groundwater at a frequency to support, and under normal conditions does support, a prevalence of vegetation commonly known as "hydrophytic vegetation," which is typically adapted for life in saturated soil conditions. Outside the critical area, land that is considered a nontidal wetland in accordance with the most current version of the Federal Manual for Identifying and Delineating Jurisdictional Wetlands, which contains the most current standards and which may be amended and interpreted by the United States Environmental Protection Agency. Inside the Chesapeake Bay Critical Area, a "nontidal wetland" is the same as nontidal wetlands as defined by the state critical area program. The sale of commodities or goods (usually in large quantities) to distributors, contractors or retail outlets for resale to ultimate consumers. Retail sales and service uses may be included as an accessory use, provided that the products sold are stored or distributed either by the owner or lessee of the site, not more than 10% of the floor space of the main structure may be devoted to the retail sales of articles stored or distributed on the premises and any service facilities are limited to the repair and/or service of products stored or distributed by the owner or lessee of the site. Nothing herein contained shall be construed to permit the operation of general retail sales business. The equipment that converts and then stores or transfers energy from the wind into usable forms of energy. This equipment includes any base, blade, foundation, generator, nacelle, rotor, tower, transformer, vane, wire, inverter, batteries, guy wire or other component used in the system. The individual(s) or entity that owns, or intends to own, the property upon which the wind energy system will be operated in accordance with this chapter. The height as measured from the lowest point along the base to the highest point of the support tower, the top of the turbine device, or the area swept by the rotor blades, whichever is greatest. A monopole, lattice, or guyed structure that supports a wind generator. One or more principal or accessory devices and essential supporting structures specifically designed to convert kinetic wind energy to electric power, to be used for direct consumption on the subject property, inter-connection to the electric utility power grid to offset energy use on the subject property, sold for-profit to a wholesale electricity market through a regional transmission organization and an inter-connection with the local utility power grid and/or for direct distribution to a number of properties and consumers. A single-towered wind energy conversion system that is used to generate electricity; has a rated capacity of 15 kilowatts or less for ground-mounted systems and two kilowatts or less for roof-mounted systems; and has a total height of 50 feet or less for ground-mounted systems and 15 feet in height above the base of the mounted wind energy structure for roof-mounted systems. The blades and associated mechanical and electrical conversion components mounted on top of a wind tower. An open area between a lot line and the setback line within which no structure shall be located except as provided by this chapter. See Figure III-1 below. A yard extending the full width of the lot, which includes the area between the front building setback line and the road right-of-way. In the case of a corner or through lot, both yards extending along the road right-of-way shall be considered "front yards." A yard extending across the full width of the lot between the rear building setback line and the rear lot line. A yard extending from the front yard to the rear yard between the side building setback line and the side lot line. The official designated by the County Administrator as responsible for enforcing and administering all requirements of this chapter. A permit issued by the Zoning Officer that authorizes the recipient to make use of property in accordance with the requirements of this chapter. Editor's Note: See now Environment Article, § 15-407. Editor's Note: See Ch. 15, Building Code. Editor's Note: Appendix I is included as an attachment to this chapter. Editor's Note: Figure IV-1 is included as an attachment to this chapter. Editor's Note: See now Environment Article, Title 16.